Many things this holiday season put me in Snoopy dance mode: decorating the house, trimming the tree, hot cocoa and s’mores, caroling, and, oh yeah, our trip to Disney World this week. Christmas spirit is ON at the Boswell house. But just as important is teaching my kids to give back, help others less fortunate, and focus on the real reason we celebrate Christmas. Better said, put Christ in Christmas. So we donate to Operation Christmas Child, buy gifts for our sponsored Angel Tree child (which the kids LOVED), and serve at the Carpenter’s Table, our local food pantry (check it out at www.thecarpenterstable.org) But is it enough? I struggle with the push and pull of Christmas: of wanting to give thoughtful, generous gifts to my family and friends but worrying about how my focus on that shifts me from what I should be celebrating: the miracle of the Messiah’s birth. Shopping for gifts, you can easily get sucked into the vortex of the commercial-driven madness, the quest for the ever elusive “perfect” gift. It’s a conundrum, to be sure. So I’ve decided that it’s all about BALANCE. To joyfully give and teach my kiddos the same. To meditate and pray. To share time with loved ones. And anything that can point me to the manger, to Bethlehem, to Jesus. 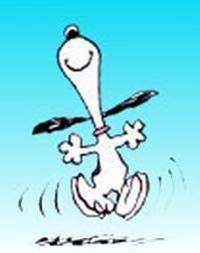 Now THAT deserves a Snoopy dance! Sherry, I just subscribed to your blog! I’m sorry to say I didn’t realize until now that you decided to go with Music to My Ears! Anyway, I keep the decorations simple. The house looks festive but it doesn’t take that long to do. I don’t drag my kids to the mall to sit on Santa’s lap. We shop for the kids early, but don’t go overboard on presents for each other or anyone else. What I’ve noticed is the kids don’t need the “hype.” They like the lights on the tree and singing Christmas carols when we get in the car. Have a blast at Disney. I’m going for the first time in January! Hi Sherry, wanted to check in and say wonderful post. Since I have a toddler, it’s easy for me to control the “madness” at this point in her life. Like the previous poster, we try to keep things simple. We have a small tree, an Advent calendar, an Advent wreath, the “fab five” in their Christmas gear and not much else. We “adopt” a needy family through the employee assistance fund at my hospital every year. I also use all my leftover reward points from various credit cards/rewards programs to donate gifts to less fortunate families. It’s not easy to stay sane in all of the Christmas craziness, but I find just being conscious of slowing down during the day helps a lot too. Not to mention beginning the day with a prayer and ending it with one, too–helps tremendously! Have a blast at the World, I’ll be thinking of you guys and wishing you safe travels, no lines and lots of family fun. Enjoy every minute. Thanks for making comments AND subscribing to my blog! Whohoo-I actually have people following me! Y’all have made my day 🙂 And I agree that LESS is MORE when it comes to getting in the Christmas spirit (except for planning a trip to Disney…LOL). Loved your ideas too-nice to see that I am not a grinch in my thinking on this! I agree with Stephanie…we have made an effort to keep the madness under control while Sarah is still little. Santa will bring 3 gifts this year (because that’s how many gifts Baby Jesus received from the Wise Men). Instead of just dropping money in the pail, we stopped to talk to the Salvation Army belllringer to let her explain to Sarah what they do with the money. We spend storytime each evening reading traditional Christmas stories and talking about the important lessons in each one and we added a few new pieces to our Fisher Price Little People Nativity. So far the biggest joy of this season has been shopping with Sarah for our Angel Tree child. Instead of rushing to mail Christmas Cards, we send handwritten Thankyou notes in Happy New Year Cards. So, I have to say that Christmas is not a very stressful time in the Youngblood House. My only Christmas wish is to keep it that way!